This happy little vintage loveseat came to live with me!! Everything mid-century modern is ridiculously expensive, but I am seriously considering the UO side table and the little "pouf" from Target (it's on sale in stores). I LOVE the blue chevron rug from Urban Outfitters, too, but it's just so pricey. Of course, this girl is on a budget. I did some antique store trekking this afternoon to get some ideas from the real-deal expensive stuff, and boy did I spend a lot of money in my mind! I'd have the coolest house! Then, since I was dreaming, I thought: Of course I'd need an awesome outfit that coordinated with my new loveseat and decor, right? Super loving on this color combination, and so glad I get to play with it in decor, too. That is really cute fabric! It would make darling curtains, or a skirt, huh? Truly, everything old is new again. 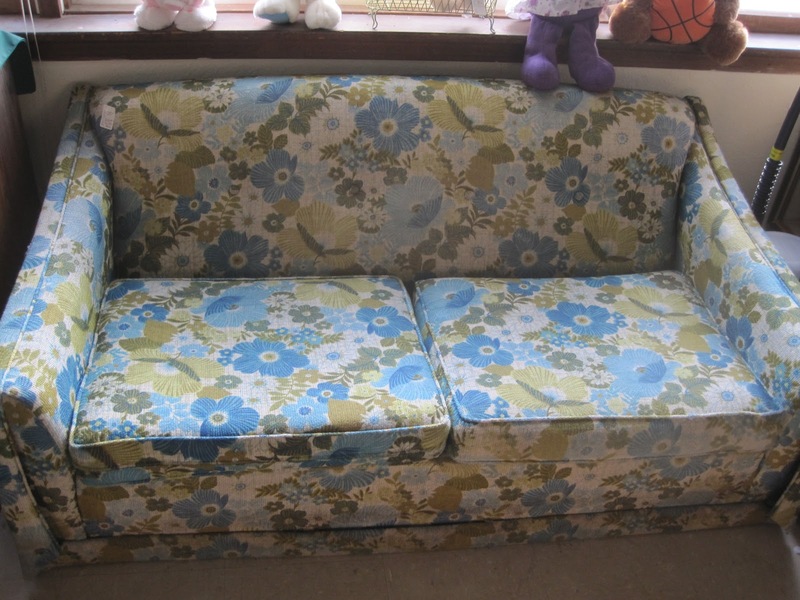 Our grandparents' couches are making a comeback. Isn't it funny how that works, Heather? Sometimes I think, I like vintage stuff too much--I won't have anything to pass down to my kids that was "current" from when I was young...if that makes any sense. What should I set aside?! My skinny jeans? Lol. And you are right--that fabric would be so fun for so many other things! I would love to make a summer blouse or sundress. Check out all the chevron DIYs online :) Good stuff!! payday uk how could it's that with all the growing armies of counselors and psychology experts the toll of broken relationships and their fallout; depression, abusing drugs etc.